One of the terms bandied about quite frequently in comic book circles these days is “iconic image”. Editors, artists and fans often refer to simple, single-character drawings as “iconic images”. In fact, these types of pictures now constitute the vast majority of modern comic book covers. There are probably a number of reasons for the emergence of this contemporary publishing fad, but back in the mid-nineties, when I drew the image seen here, illustrations of this type were more commonly referred to — often derisively — as “pin-ups”. They were considered to be generally inferior to traditional storytelling covers or pages, in part because they were much easier for artists to draw. However, so popular were they with the audience of the day that they helped fuel a brief but massive sales explosion for comics and related collectibles, such as the ubiquitous American trading card. 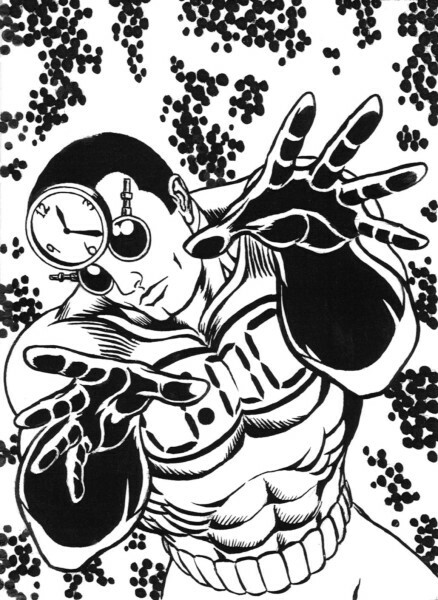 It was into this climate that my good friend Chetan Patel stepped when he set out to publish the early Tic Toc Tom mini-comics and direct-market comic books. Recognizing the potential of trading cards as a promotional item, Chetan asked a number of his associates to each create a piece of art for a series of cards he was planning on publishing as an adjunct to the comics themselves. The picture presented here was my contribution to that project. Back in the golden days of the 1970s, when I was a young lad buying comics from the local variety stores, a drawing like this would have been more commonly used as a licensing piece, or perhaps as the cornerbox picture in the upper left of a comic’s cover, as opposed to either a cover’s primary illustration or a trading-card image. But times keep changing and in this brave new digital world we now find it gracing a far-reaching 21st Century website. So, while the means of presentation may be different, it’s clear that the humble pin-up — er, I mean “iconic image” — still holds an important place in the world of popular art.